History is apparently not Newt Gingrich’s strong suit, despite the fact that he has a Ph.D. in history and taught it in college before entering politics. Probably he knows a lot about Greek or Roman history, but things that happened only 25 years ago? Don’t ask. Gingrich suggests it would be “humane” to allow illegal aliens “who have been here 25 years, go to church and raise children in our communities” — let’s give such illegal aliens legal status. Of course, he then backtracked and said, let’s not do this until after we have border security. T hat’s basically what we did in 1986 with the amnesty legislation that gave legal status to three million illegal aliens. 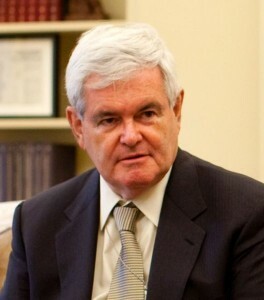 Gingrich wasn’t in Congress yet, but surely he has heard of the 1986 Immigration Reform and Control Act. It was signed into law by President Ronald Reagan. That amnesty was sold to Reagan and passed as part of a “bipartisan deal,” the terms of which were never honored. We were promised three things. First, this was to be a one-time amnesty, never to be repeated. Second, new laws were enacted to punish employers who hired illegal workers. Third, the border was to be secured. All three promises have been broken. There have been numerous small amnesties enacted since 1986 and enforcement of the employer sanctions was never undertaken in a serious way. But by far the most egregious and hypocritical broken promise was that of border security. The charade of declaring the border “secure enough” has been continued through five presidents of both political parties. It has been a bipartisan bait-and-switch game that only came to an end when the Minutemen put a huge media spotlight on the cross-border traffic and forced politicians to take up the issue. Various reasons and excuses have been offered for this failure. Often we hear that it is impossible to secure the border, so let’s move on. This seems to come from the same people who also argue that the dramatic decline in Border Patrol apprehensions shows our border enforcement is working. So, which is it? If policies A and B get a 50% decline in border crossings, why not build on that success and go after the remaining 50%? We hear only slogans and excuses, not concrete proposals for achieving border security, but it is not rocket science. 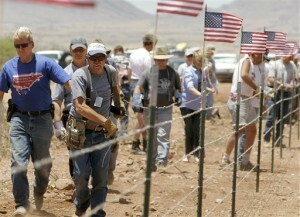 If we add enough fencing and combine it with more manpower and appropriate technology, we can secure the border. And if that does not work, then use our military. Today, after 25 years of posturing and broken promises, Americans can be forgiven for displaying a distrust of new promises. How about a plan of action, not a plan for more broken promises? Gingrich is only the latest in a long line of aspiring Republican politicians who think they can substitute another round of soon-to-be-broken promises for concrete action on border security. As for Democrats, they are even worse. Obama has made a mockery of both border security and interior enforcement. The difference is, we do not expect anything else from Democrats. So, let’s set some real benchmarks for Republican candidates who say they are committed to border security. Here are three concrete steps that a new president should take to show he is serious about it. Which candidates will pledge to do these three things on day one? First, a newly inaugurated Republican president should ask Congress to reauthorize and fully fund the Secure Fence Act of 2006, which mandates 700 miles of double pedestrian fencing on the south west border. Secondly, the new Republican president should sign an executive order rescinding the Obama administrative amnesty plan of June 2011. 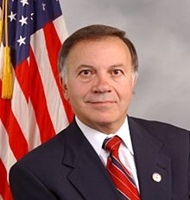 Finally, a Republican president should ask Congress to pass a law to end “anchor baby” status for children born to illegal aliens, tourists, business travelers or any person not a citizen or legal permanent resident of the United States. That law will be challenged in the courts, but that is a fight we have to win. If a candidate for president refuses to make a pledge to do these three things on his first day in the White House, we will know he is not serious about border security or immigration enforcement. We will know we are in for another four years of broken promises.